I am sure I am not alone in thinking when on a foriegn trip or holiday "I would rather live here than back at home", but what would I do to earn a living? work behind a bar, on a farm, on a fishing boat, washing up in a café? I thought I had spotted a niche on our visit to the Greek islands, particularly when visiting Patmos. I would open a paint shop. Nothing on the scale of when we have in the UK such as B&Q or Homebase with aisle after aisle of rainbow shades, subtle hues and colour-wheel matching. No. This would be easy - after all, I would only need to stock two colours. Smugly I wandered around with this idea in my head. 'Tonys Paint Shop' - marvellous. Tins of paint piled high, and customers queueing at the door. "The Blue sir? - Yes, it's just over there, by the White"
I discussed my plan with a few locals. I had completely missed the point. "Patmos Blue" said one, a decorator and handyman "it's the bane of our lives"
I realised that they must be telling the truth, as I looked around the town and stared to notice the different Blues. Not here the strong dark blue of the striped on the Greek flag. No. I enquired if perhaps the woodwork of the Council building in the main square in Chora might be the definitive article. 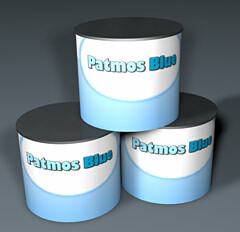 the 'Official' Patmos Blue? Three pairs of eyes swivelled skywards.